Our latest toy, the iMac really rocks! The beautiful iMac 20-inch aluminium is absolutely impressive, inside and out! Terribly glad that we followed our elder son, David to Machines, Malaysia’s largest Apple reseller at Mid Valley, Megamall when he had wanted to buy a Mac notebook. An awesome MacBook Pro he did buy that day! He had spoken so much about the greatness of Mac but I was never swayed to desire one. Firstly, it is so expensive (I need not change the PC that was already serving me so well!) and secondly I felt intimidated by its awesomeness, apprehensive that I cannot cope with a Mac, lacking confidence and feeling inadequate. Afraid to move out of my comfort zone…aging mind does inhibits so! All these just disappeared the moment I set my eyes on the iMac, I was obviously and undeniably blown away! Its sleek and glossy 20-inch widescreen display captivated me so – not only was the width impressive but photos and movies seem to pop up with such brilliance in clarity and colors. (My 17-inch Philips LCD monitor pale very much in comparison…hehe, if I had not seen the iMac, it was perfectly fine!) Besides, the whole design look impeccable – glass display beautifully framed in anodized aluminium, machine is so slim and yet powerfully packed with all that are necessary to function as an outstanding and extraordinary computer. 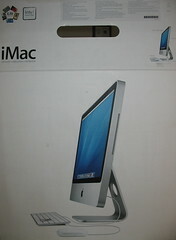 On top of that, the many features, softwares and others that are integrated therein just make the iMac so irresistable! Hence, here it is…our iMac! It really rocks! I am so happy to have David as my tutor and mentor! He had even bought a book titled ‘The Rough Guide to Macs & OS X’ by Peter Buckley & Duncan Clark, to tide me over. What an exceptional son he is! Thus, my conversion from a Window-based PC to a Mac (with Mac OS X Leopard) was quite smooth really! 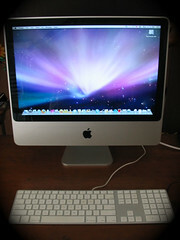 Learn more about the iMac and find out how Mac operates, if you feel inclined to switch to a Mac.